SETTING: In the 9000 hectare Karongwe Game Reserve, a mere stone’s throw in a south-westerly direction from the famed Kruger National Park, with Hoedspruit the closest town. Three rivers, all tributaries of the mighty Olifants River, twist and turn through the reserve, dividing the different sections. 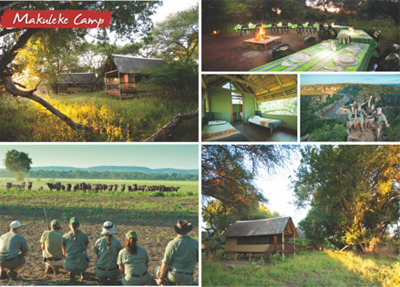 The camp itself is situated on the banks of the Karongwe River, mostly a dry river bed. Except for a very small section in the northern part, we can traverse over most of the reserve. Karongwe falls within the savannah biome of Southern Africa. 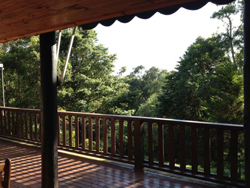 Mixed lowveld and Mopani bushveld, grass savannah, riverine vegetation, rocky outcrops and undulating hills and valleys form the natural landscape. ANIMAL AND PLANT LIFE: Over 60 mammal species and an abundant bird life makes for good hunting ground with camera in hand. Sightings of the all the cats – lion, leopard and cheetah – as well as elephant and white rhino is an almost daily occurrence. With an unfenced camp, nightly visits from other species, like hyena, is also not out of the ordinary. TEMPERATURE: Summer between mid-20°C (68°+F) to high 30°C (86°+F), sometimes exceeding 40°C (104°F). Heavy thunderstorms are also experienced in summer and sometimes frontal rainfall over a longer period. Winter is dry, with temperatures fluctuating from around 6°C (43°F) in the early morning, to between 18°C (65°F) and 32°C (89°F) for the rest of the day, before going down again at sunset. Camp Accommodation: Ten walk-in style Meru tents, with twin beds (students share tents) and supplied bedding (a duvet and one pillow; you can bring an extra pillow/blanket especially in winter). Ablution facilities are shared. 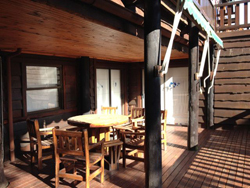 Communal area: There is a central area, with viewing decks which forms a square with a campfire pit in the middle. Many students choose to make the viewing decks their ‘bedroom’ for part of or sometimes for the whole of the course. One of the decks serves as the open air dining area, lecture room and study area. Electricity: There is none – paraffin lamps that are used for all lighting and a generator is operated for only a couple of hours a day for camp use and to charge camera batteries. For the purpose of studying, a headlamp is therefore recommended as well as an extra battery operated lamp if you wish to study in your tent at night. The kitchen is equipped with gas fridges for storage of all perishable food items. There is no space for personal items (drinks, water or other). 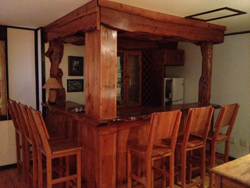 A full selection of affordable drinks (soft drinks, beers & ciders) are however available for purchase. Cordial fruit juices are served with meals with tea and coffee available throughout the day. Drinkable water is available from the taps. Take note: A laundry service is provided by the camp cleaner. There are no credit/debit card facilities at the camp. Bring cash for drinks, laundry and other purchases like t-shirts, hats, fleeces etc. The game viewing vehicles are open Land Rover TDI’s. SETTING: The wildest and most remote part in the northern section of the famed Kruger National Park is where the Makuleke concession lies, inaccessible to the general public. Nestled between the Limpopo and Luvuvhu Rivers, the more than 24 000 hectares is the ancestral home of the Makuleke people and filled with the folklore of early explorers and ancient civilization. It is the most diverse and scenically attractive area in the whole of the world famous park and offers great wildlife viewing, unbelievable birding and varied vegetation. ANIMAL AND PLANT LIFE: Sightings abound and the list is long. 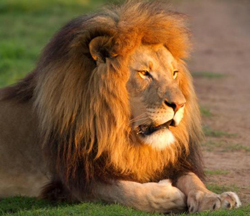 Lions and leopards are a special occurrence, not to mention aardvark, bush pig and eland. Plains game such as zebra, kudu, impala and nyala are in abundance, as well as herds of elephant and buffalo, with a few rhinos in between. The camp itself is not fenced which means animals freely move through. This part of Kruger is also known to be one of the best birding areas in the park and is home to rarely-seen species such as Pel's fishing owl, wattle-eyed flycatcher and grey-headed parrot. Scenery ranges from the beautiful, quietly-flowing Levuvhu River shaded by Nyala trees and fever tree forests; to the awesome Lanner Gorge, palm-fringed wetlands and rocky outcrops with thousand-year old baobab trees. TEMPERATURE: A subtropical climate, with very hot summers and average daytime temperatures of 40°C (104 F) and intermittent rain showers between October and March. Winters are warm and dry, temperatures varying between 9°C and 26 °C. Early mornings and late afternoon/evenings during winter can get very cold though, so be sure to bring sufficient warm clothing. CAMP: Accommodation: Ten comfortable thatched, tented rooms placed on wooden decks in the shade of large nyala trees, with a veranda overlooking the surrounding bush. Each room (two students share) has an en-suite bathroom consisting of a shower and washbasin. Bedding is provided (a duvet and one pillow), but you might want to bring an extra blanket for winter, as well as a pillow if so preferred. Communal area: This area consists of a thatch-roofed open sided deck where all meals, lectures and studying takes place. A clearing for evening camp fires creates an idyllic setting for social and leisure time. Electricity: There is none – paraffin lamps are used for all lighting and a generator is operated for only a couple of hours a day for camp use and to charge camera batteries and cell phones for emergency use. For the purpose of studying, a headlamp is therefore recommended as well as an extra battery operated lamp if you wish to study in your tent at night. Take note: A laundry service is provided by the camp cleaner. There are no credit/debit card facilities at the camp. Bring cash for drinks, laundry and other purchases like t-shirts, hats, fleeces etc. This is a last minute special about our course in August. 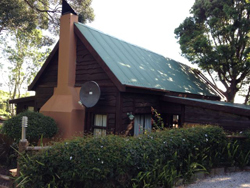 Accommodation at Kingfisher Lodge (instead of Trogon House & Forest Spa) : Kingfisher Lodge is a stunning house situated in Ashlands Complex, also in The Crags. We often use it for our lectures especially during Post-Production as this is where our Edit Suites are situated. It also offers decks and lush gardens to practice your camera work before going out in the field and start shooting your own short documentary. 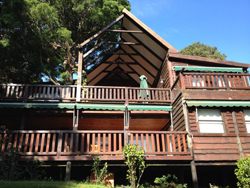 Kingfisher Lodge is a two stories house where the top part belongs to our course director Sebastien Rombi and his family (fiancee and daughter). 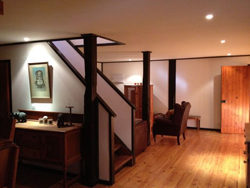 The bottom part has two rooms for 4 students sharing, 2 toilets and 1 bathroom, our edit suites and a stunning wooden bar (for after lectures). 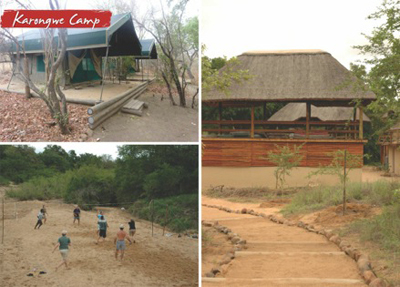 Kingfisher Lodge is the ideal venue to learn about wildlife filmmaking and have fun at the same time. Three meals a day and unlimited tea and coffee. All transport during the duration of the course as well as the road-transfers from George's Airport and return (1h30 minute one way). Access to professional 2D and 3D video and editing equipment. Lectures and tuition for three students minimum and six maximum by professional 2D and 3D nature filmmakers who will be with you during Pre-Production, Production and Post-Production. A certificate of completion of the course. A DVD of your own broadcast-safe three minutes nature documentary made with Beyond Borders Film School. The move is going to be the best thing for the sanctuary and all the animals involved, from a tourism and a health point of view. 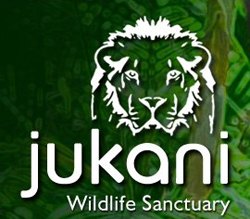 We are running this campaign in order to raise funds to be able to film and create a 1 hour documentary about the translocation of the animals of Jukani. 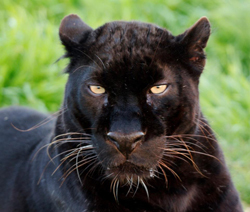 The film will cover the building of the new site, habituating the cats to their translocation crates, the actual move of all the animals and them settling into their new enclosures as well as interviews about hot topics such as wildlife sanctuary VS canned hunting! Your contribution to this funding will go towards petrol expenses, equipment costs, freelance cameraman recruitment and a small amount towards accommodation costs when Beyond Borders need to be at the old site. The more money Beyond Borders can raise the better their chances to make a world class documentary that will be channel broadcast quality. If you are unable to donate cash to this project, please help us by shouting out about it. Please share our link to this campaign on your social media sites, and 'SHOUT' about it to friends, family and anyone who feels as passionate about Africa's big cats and wildlife as we do.